Recombinant full length protein corresponding to Human p53. Wild type. 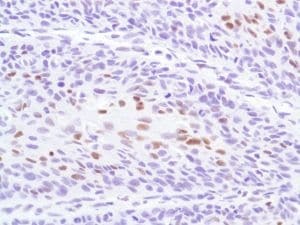 IHC-P: Human B cell lymphoma, lung adenocarcinoma, breast ductal cell carcinoma , cervical squamous cell carcinoma, hepatocellular cell carcinoma, bladder transitional cell carcinoma, ovarian adenocarcinoma, stomach adenocarcinoma, lung adenocarcinoma, colon adenocarcinoma and colon carcinoma tissue. Our Abpromise guarantee covers the use of ab27598 in the following tested applications. Boil tissue section in 10mM citrate buffer, pH 6.0 for 10 minutes followed by cooling at room temperature for 20 minutes. Acts as a tumor suppressor in many tumor types; induces growth arrest or apoptosis depending on the physiological circumstances and cell type. Involved in cell cycle regulation as a trans-activator that acts to negatively regulate cell division by controlling a set of genes required for this process. One of the activated genes is an inhibitor of cyclin-dependent kinases. Apoptosis induction seems to be mediated either by stimulation of BAX and FAS antigen expression, or by repression of Bcl-2 expression. Implicated in Notch signaling cross-over. Isoform 2 enhances the transactivation activity of isoform 1 from some but not all TP53-inducible promoters. Isoform 4 suppresses transactivation activity and impairs growth suppression mediated by isoform 1. Isoform 7 inhibits isoform 1-mediated apoptosis. Note=TP53 is found in increased amounts in a wide variety of transformed cells. TP53 is frequently mutated or inactivated in about 60% of cancers. TP53 defects are found in Barrett metaplasia a condition in which the normally stratified squamous epithelium of the lower esophagus is replaced by a metaplastic columnar epithelium. The condition develops as a complication in approximately 10% of patients with chronic gastroesophageal reflux disease and predisposes to the development of esophageal adenocarcinoma. Defects in TP53 are a cause of esophageal cancer (ESCR) [MIM:133239]. Defects in TP53 are a cause of Li-Fraumeni syndrome (LFS) [MIM:151623]. 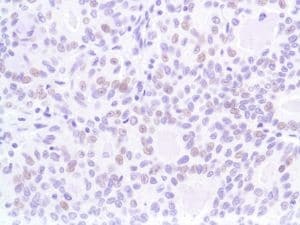 LFS is an autosomal dominant familial cancer syndrome that in its classic form is defined by the existence of a proband affected by a sarcoma before 45 years with a first degree relative affected by any tumor before 45 years and another first degree relative with any tumor before 45 years or a sarcoma at any age. Other clinical definitions for LFS have been proposed (PubMed:8118819 and PubMed:8718514) and called Li-Fraumeni like syndrome (LFL). In these families affected relatives develop a diverse set of malignancies at unusually early ages. Four types of cancers account for 80% of tumors occurring in TP53 germline mutation carriers: breast cancers, soft tissue and bone sarcomas, brain tumors (astrocytomas) and adrenocortical carcinomas. 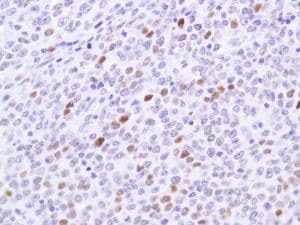 Less frequent tumors include choroid plexus carcinoma or papilloma before the age of 15, rhabdomyosarcoma before the age of 5, leukemia, Wilms tumor, malignant phyllodes tumor, colorectal and gastric cancers. Defects in TP53 are involved in head and neck squamous cell carcinomas (HNSCC) [MIM:275355]; also known as squamous cell carcinoma of the head and neck. Defects in TP53 are a cause of lung cancer (LNCR) [MIM:211980]. Defects in TP53 are a cause of choroid plexus papilloma (CPLPA) [MIM:260500]. Choroid plexus papilloma is a slow-growing benign tumor of the choroid plexus that often invades the leptomeninges. In children it is usually in a lateral ventricle but in adults it is more often in the fourth ventricle. Hydrocephalus is common, either from obstruction or from tumor secretion of cerebrospinal fluid. If it undergoes malignant transformation it is called a choroid plexus carcinoma. Primary choroid plexus tumors are rare and usually occur in early childhood. Defects in TP53 are a cause of adrenocortical carcinoma (ADCC) [MIM:202300]. ADCC is a rare childhood tumor of the adrenal cortex. It occurs with increased frequency in patients with the Beckwith-Wiedemann syndrome and is a component tumor in Li-Fraumeni syndrome. Belongs to the p53 family. The nuclear export signal acts as a transcriptional repression domain. The TADI and TADII motifs (residues 17 to 25 and 48 to 56) correspond both to 9aaTAD motifs which are transactivation domains present in a large number of yeast and animal transcription factors. Acetylated. Acetylation of Lys-382 by CREBBP enhances transcriptional activity. Deacetylation of Lys-382 by SIRT1 impairs its ability to induce proapoptotic program and modulate cell senescence. Phosphorylation on Ser residues mediates transcriptional activation. Phosphorylated by HIPK1 (By similarity). Phosphorylation at Ser-9 by HIPK4 increases repression activity on BIRC5 promoter. Phosphorylated on Thr-18 by VRK1. Phosphorylated on Ser-20 by CHEK2 in response to DNA damage, which prevents ubiquitination by MDM2. Phosphorylated on Thr-55 by TAF1, which promotes MDM2-mediated degradation. Phosphorylated on Ser-46 by HIPK2 upon UV irradiation. Phosphorylation on Ser-46 is required for acetylation by CREBBP. Phosphorylated on Ser-392 following UV but not gamma irradiation. Phosphorylated upon DNA damage, probably by ATM or ATR. Phosphorylated on Ser-15 upon ultraviolet irradiation; which is enhanced by interaction with BANP. Dephosphorylated by PP2A-PPP2R5C holoenzyme at Thr-55. SV40 small T antigen inhibits the dephosphorylation by the AC form of PP2A. May be O-glycosylated in the C-terminal basic region. Studied in EB-1 cell line. Ubiquitinated by MDM2 and SYVN1, which leads to proteasomal degradation. Ubiquitinated by RFWD3, which works in cooperation with MDM2 and may catalyze the formation of short polyubiquitin chains on p53/TP53 that are not targeted to the proteasome. Ubiquitinated by MKRN1 at Lys-291 and Lys-292, which leads to proteasomal degradation. Deubiquitinated by USP10, leading to its stabilization. Ubiquitinated by TRIM24, which leads to proteasomal degradation. Ubiquitination by TOPORS induces degradation. Deubiquitination by USP7, leading to stabilization. Isoform 4 is monoubiquitinated in an MDM2-independent manner. Monomethylated at Lys-372 by SETD7, leading to stabilization and increased transcriptional activation. Monomethylated at Lys-370 by SMYD2, leading to decreased DNA-binding activity and subsequent transcriptional regulation activity. Lys-372 monomethylation prevents interaction with SMYD2 and subsequent monomethylation at Lys-370. Dimethylated at Lys-373 by EHMT1 and EHMT2. Monomethylated at Lys-382 by SETD8, promoting interaction with L3MBTL1 and leading to repress transcriptional activity. Demethylation of dimethylated Lys-370 by KDM1A prevents interaction with TP53BP1 and represses TP53-mediated transcriptional activation. Cytoplasm; Cytoplasm. Nucleus. Nucleus > PML body. Endoplasmic reticulum. Interaction with BANP promotes nuclear localization. Recruited into PML bodies together with CHEK2; Nucleus. Cytoplasm. Localized in both nucleus and cytoplasm in most cells. In some cells, forms foci in the nucleus that are different from nucleoli; Nucleus. Cytoplasm. Localized in the nucleus in most cells but found in the cytoplasm in some cells; Nucleus. Cytoplasm. Localized mainly in the nucleus with minor staining in the cytoplasm; Nucleus. Cytoplasm. Predominantly nuclear but localizes to the cytoplasm when expressed with isoform 4 and Nucleus. Cytoplasm. Predominantly nuclear but translocates to the cytoplasm following cell stress. Formalin-fixed, paraffin-embedded human B cell lymphoma tissue stained for p53 with ab27598 in immunohistochemical analysis. Formalin-fixed, paraffin-embedded human lung adenocarcinoma tissue stained for p53 with ab27598 in immunohistochemical analysis. 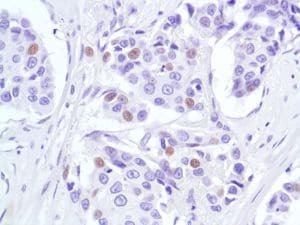 Formalin-fixed, paraffin-embedded human breast ductal cell carcinoma tissue stained for p53 with ab27598 in immunohistochemical analysis. Formalin-fixed, paraffin-embedded human cervical squamous cell carcinoma tissue stained for p53 with ab27598 in immunohistochemical analysis. Formalin-fixed, paraffin-embedded human hepatocellular cell carcinoma tissue stained for p53 with ab27598 in immunohistochemical analysis. Formalin-fixed, paraffin-embedded human bladder transitional cell carcinoma tissue stained for p53 with ab27598 in immunohistochemical analysis. Formalin-fixed, paraffin-embedded human ovarian adenocarcinoma tissue stained for p53 with ab27598 in immunohistochemical analysis. Formalin-fixed, paraffin-embedded human stomach adenocarcinoma tissue stained for p53 with ab27598 in immunohistochemical analysis. Formalin-fixed, paraffin-embedded human colon adenocarcinoma tissue stained for p53 with ab27598 in immunohistochemical analysis. ab27598 has not yet been referenced specifically in any publications. Publishing research using ab27598? Please let us know so that we can cite the reference in this datasheet. There are currently no Customer reviews or Questions for ab27598.